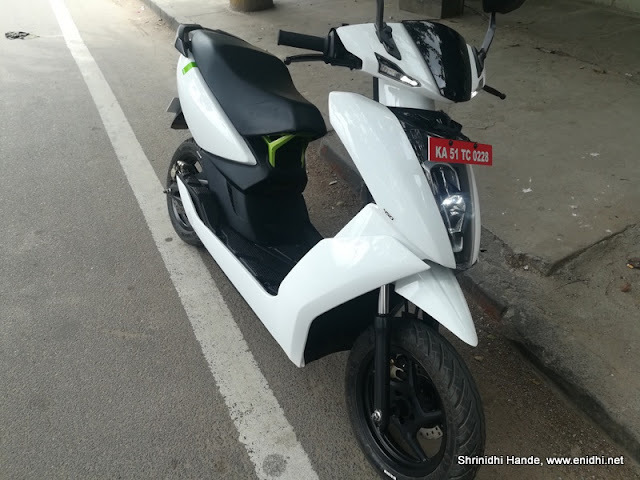 Last Saturday I experienced Ather Energy’s 450 electric vehicle in Bengaluru. I spent about an hour taking two test drives, interacting with staff and knowing more details about this newly launched and innovative product. I have planned 3 posts from this experience- This post, the first one will answer a set of FAQs, to give you immediate answers to various burning questions you may have about the Ather e-scooter. The second post will be my detailed experience at the centre with detailed review of the vehicle and a final post will cover financial aspects of owning an e-bike vs a conventional bike. 1. What is the on road price of Ather A450 electric scooter? 2. What is Ather One Subscription? 3. Can we manage without Ather One? You’ve to manage without a sim card for the display & navigation or spend separately on sim card. Without a data sim card (cost of which is included in Ather One subscription) you can’t use navigation and scooter can’t send any feedback/data back to Ather. Otherwise you can ride around just fine. Note that Ather One may have its own T&C. Website says Ather One covers labour charge, consumables like brake pads. I have sought clarification if it includes tyre and belt replacement as well-I feel it isn't. 4. What is FAME subsidy? 5. What is the range of Ather e-scooter on full charge? A450 has a range of 75 kms if driven on Eco Mode, 60 if driven without Eco mode. A340 has a range of 60 kms if driven on Eco Mode, 50 if driven without Eco mode. 6. What happens if we turn on Eco Mode? Eco mode will NOT facilitate rapid acceleration, to save on power draining rapidly. I think it may also limit top speed. Thus Eco mode will give 10-15% extra range, at the cost of riding experience. 7. How long Ather ebike’s battery is expected to last? 8. What is the top speed of Ather Energy 450? 9. What is the difference between the two models- 340 and 450? 340 is cheaper of the two- gets slightly less powerful battery, less top speed, less range. It is 15k cheaper than the other model, called 450 which has slightly more range, power. Other specifications seem to be same. 10. What will be the running cost of Ather ebikes? The actual running cost- cost of electricity-will be negligible- free if you use Ather Hub. May be just 20-25 paise per km (Assume 3 units for 60 kms, depending on which consumption slab you are in, you may have to pay anywhere between Rs 3 to Rs 8 per unit. Assuming Rs 5 per unit, it will cost Rs 15 for 60 kms or 25 paise per km. Assuming 30 km usage per day, around Rs 230 per month will be electricity charge for a household that consumes reasonable amount of electricity. Out of this Ather One subscription is optional, so minimum monthly net spend will be Rs 1350 from second year onwards. Please check this detailed analysis on the financials. 11. Is ather electric scooter strong enough for every day needs? It is certified to climb a slope of upto 18 degrees incline. On plain surface, myself and saakshi rajat did a double ride- didn’t face any performance issue. Top speed of 70-80 kmph and a range of 60-70kms is fairly adequate for city usage. Ather is trying to ensure that you will always find a charging point within 4 kms when inside city limits- so should you run out of charge, you can get it charged at nearest charging station, not necessary to go back to home. 12. What are the limitations we should keep in mind while considering Ather ebikes? If you are not staying in ground floor, charging station can be installed in garage with consent from apartment society etc. Or the conventional cable charger can be purchased, which can be used along with an extension chord to say reach your home in first floor. Though e-bikes don’t pollute environment, two third of India’s electricity comes from non renewable sources of energy such as petroleum and natural gas. So it is not 100% green- the pollution has already been caused somewhere else while this electricity was generated. Of course it won’t pollute already polluted cities more, so we can give some credit. 13. How long does it take to charge an Ather eBike? Using fast charge, you can charge upto 80% in about 1 hours. But full charge will take much longer. Ather is establishing charging hubs all over Bengaluru, so you don’t have to go back home to charge. You can charge at nearest hub, subject to availability. One charging station will be installed in your home. 14. Does it make economical sense to buy Ather One right now? Please wait for my other post with detailed analysis. 15. What are the other alternatives to Ather ebike? Another startup named Emflux has displayed a electric sports bike at Auto Expo- It is available for purchase from March 2019 and has a price tag of 5.5 lakh+. It used liquid cooled Induction motor as against Ather’s brushless DC motor and promises a 200km range. So depending on your budget, usage and preference you can either buy a relatively cheaper Smartron, a decent Ather or a Superbike. 16 Does Ather’s ebike got a USB port to charge our mobiles? 17. Ather ebikes are available in what all colours? 18. Where can I test drive an ather 450 e-scooter? You can either walkin to their showroom in Indiarangar defence colony. However better to book an appointment on their website and go on scheduled date n time. 19. In which all cities Ather ebikes will be available? 20. From when deliveries will start? 21. How many people have booked Ather ebike so far? 22. What are the other cool features in Ather 450? From a first impression perspective, I know that my bajaj Pulsar (costs the same as ather) runs about 10,000 kms a year and costs about Rs. 2-2.5 per kilometer including quarterly service for a period of 4 years. In comparison, Ather would cost about Rs. 1.5/km if I factor just electricity and battery replacement costs. Does not look all that cost effective to me, but look forward to your analysis!